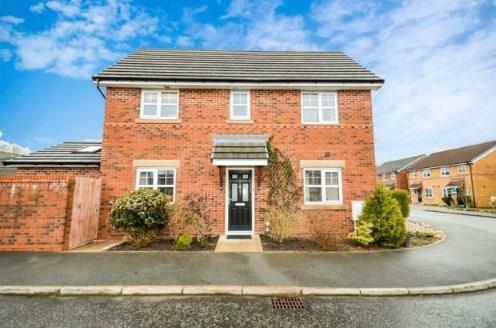 3 Bedroom Semi Detached House For Sale in Chorley for Asking Price £190,000. This immaculate three bedroom semi detached will appeal to a range of home buyers including first time buyers, young couples and family buyers. The property has a range of attractive features and offers bright and airy living. The property comprises of entrance hall with downstairs wc, modern kitchen, lounge and extra family room. The first floor comprises of master bedroom with en-suite, two extra bedrooms and family bathrooms. The property benefits from parking for two cars, single garage and private enclosed garden. UPVC front double glazed door, radiator, ceiling light, access to WC and stairs to first floor. Radiator, tiled flooring, tiled splashbacks, ceiling light. Low level WC and wash hand basin. Double glazed uPVC window, double glazed French doors , radiator, ceiling light and television point. UPVC sliding double glazed door to garden, double glazed velux windows, radiator, laminate flooring and ceiling light. Double glazed uPVC windows, radiator, tiled flooring, spotlights, granite effect work surface, wall and base units, one and a half bowl sink, integrated electric oven, integrated electric hob with overhead extractor, integrated dishwasher, integrated washing machine and fridge/freezer. Radiator, built-in storage cupboard and ceiling light. Double glazed uPVC window, radiator, a built-in wardrobe and ceiling light. Double glazed uPVC window, heated towel rail, tiled flooring, part tiled walls, ceiling light, low level WC, single enclosure shower and pedestal sink. Double glazed uPVC window, radiator and ceiling light. Double glazed uPVC window, heated towel rail, tiled flooring, part tiled walls, spotlights, low level WC, panelled bath with mixer tap, shower over bath and pedestal sink.